Working on environmental projects for 30 years. If a tough environmental problem has you stuck, Chris can help. Chris began working with Wynn L. White Consulting Engineers in 1988, right after graduating from high school, first in completing asbestos inspections during the initial round of school asbestos surveys across Louisiana, and then in performing asbestos air monitoring and contractor observation during asbestos abatement projects. Working his way through school, Chris received his Bachelor of Arts in History in 1993 from Louisiana State University , and following in his father’s footsteps, his Bachelor of Science degree in Civil Engineering in 2001, also from Louisiana State University. If you’re interested in his journey from one side of the brain to the other, just ask. Chris is a U.S. history fan (not surprising, considering his first degree from LSU), LSU and Chicago Cubs fan, amateur photographer, husband, father of four, and The World’s Most Interesting Engineer. Several years ago, Chris started blogging on the company website, and selected The World’s Most Interesting Engineer as the title. Not because he really thinks he’s the world’s most interesting engineer, but really because the Dos Equis “Most Interesting Man in the World” commercial series was so popular. Really, those may be the best commercials of all time, but at any rate, Chris thought it was a clever title, and also poked a little fun at the engineering profession, since a lot of times engineers think their work is the most important thing ever, and most people couldn’t care less what engineers do. Chris is an accredited Asbestos Inspector, Asbestos Contractor/Supervisor, Asbestos Trainer, Leadership in Energy and Environmental Design (LEED) Accredited Professional, a registered professional engineer (Louisiana), and is a member of the American Society of Civil Engineers. 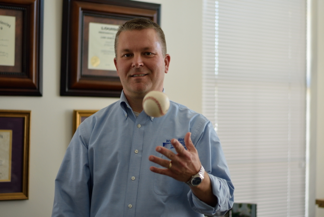 Chris now manages most of the firm’s projects, mostly for schools, hospitals, contractors, and petrochemical clients. Much of the work involves asbestos, lead, mold, and demolition.